New Prospect Baptist Church was founded in 1870 when some of the black brethren of Big Creek Baptist Church voiced a desire to have their own place of worship. 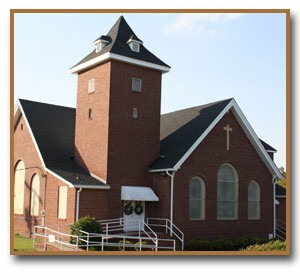 Along with the assistance of Big Creek Baptist Church, New Prospect Baptist Church was born. The first church was a brush harbor with wooden benches. The church progressed to a log cabin, and later to the church as it stands today. The word Missionary was added to the name in 1990. New Prospect began with several members that flourished to a membership of over 350 in the late 1980's and 90's to a present membership of 270. Since it's beginning in 1870 there have only been eleven Pastors. Rev. Dr. Norman P. Pearson Sr. was the longest serving Pastor. He served 42 years. He served from 1969 - 2011 when God called him home. Under the leadership of Pastor Pearson many improvements and much progress was made. Along with the traditional church ministries others were added; Youth Ministry, Brotherhood, 55 and 80 Plus Ministry, just to name a few. The church sanctuary was completely remodeled. A Lift was later added to transport our elderly and handicapped upstairs. New Prospect is filled with the Holy Spirit from the Crossed Sanctuary to the preaching of God's Word that fills it's walls.